Warner Bros. will descend upon WonderCon tomorrow with a 90-minute panel at the Anaheim Convention Center that runs from 4:30 PM to 6 PM. The studio hasn't revealed exactly what will be showcased at this time, but earlier today, the studio unveiled the new WonderCon poster for their Annabelle follow-up, which has now been titled Annabelle: Creation. The studio has also shared a trailer preview, getting fans ready for the trailer debuts tomorrow, presumably during the studio's big WonderCon event. 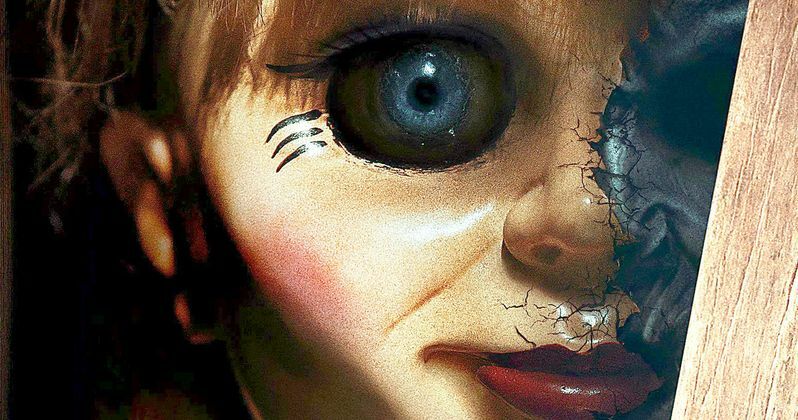 Warner Bros. debuted this poster and trailer preview on Youtube, giving fans a sneak peek at how this wicked doll was hand-crafted. While we don't see him in this teaser, Anthony LaPaglia plays the dollmaker who created the infamous real-life demon doll. This never-before-seen footage has him putting the doll together, branding the wooden doll with the Mullins Toy Company Seal, along with a limited edition stamp. This doll is the first in a limited edition run of 100. We also see Annabelle's eyes com to life before she is sealed in her box. Annabelle 2 tells the tale of a dollmaker and his wife who, several years after the tragic death of their child, welcome a nun and several girls from a shuttered orphanage into their home. Very soon, however, they become the target of the dollmaker's possessed creation, Annabelle. Annabelle 2 also stars Miranda Otto (Showtime's Homeland, The Lord of the Rings Trilogy), Stephanie Sigman (Spectre), Talitha Bateman (The 5th Wave), Lulu Wilson (upcoming Ouija 2, Deliver Us From Evil), Philippa Anne Coulthard (After the Dark), Grace Fulton (Badland), Lou Lou Safran (The Choice), Samara Lee (Foxcatcher, The Last Witch Hunter) and Tayler Buck. David F. Sandberg directs this horror sequel, which is produced by Peter Safran and James Wan (The Conjuring movies). The screenplay was written by Gary Dauberman, who also wrote the original thriller Annabelle. This project marks David. F. Sandberg's follow-up to his critically-acclaimed feature debut Lights Out, which terrified audiences last summer and became a surprise hit at the box office. The low-budget thriller made $66.8 million domestically and $75.1 million internationally for a worldwide tally of $141.9 million, from just a $4.9 million budget. Now the filmmaker returns to tell Annabelle's origins in Annabelle: Creation. Much like Lights Out, the original Annabelle movie was also a profitable low-budget hit, earning $84.2 million domestically and $172.6 million internationally for $256.8 million worldwide, from just a $6.5 million budget. New Line Cinema has set an August 11 release date for Annabelle 2, which is currently the only movie slated for wide release that weekend. It does come one week after Sony's highly-anticipated adaptation The Dark Tower (August 4) and a week before Lionsgate's The Hitman's Bodyguard and Open Road Films' The Nut Job 2: Nutty by Nature (August 18). Take a look at the trailer preview and poster below for Annabelle: Creation.